Have you been having some trouble logging in to our new website? Follow our simple step-by-step guide to get started. To obtain pricing and place orders, you will need to login to the site. To login, please click Sign in /Register at the top right side of the page. 1) Does your customer number contain only digits? a) If YES you are a main user, please go to step 3.
b) If NO this means you have a co-user account, please go to step 2.
a) Tick the “sign in as co-user” field, which will produce an extra field, “User Name". b) Your Customer number is your account number. If you don't know this, it is usually your username with the leading zero and/or letters at the end removed (e.g. 01234c = 1234, 1234c = 1234, 01234 = 1234). c) Your Username is the code containing the zero at beginning and/or digits at the end. 3) Your password is exactly the same as your password on the previous website. Your password is case sensitive, so please double check this if you are unable to login after following these steps. 4) If you receive an error message e.g. “An error occurred processing your inquiry. 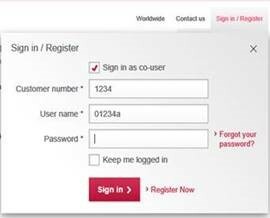 Please review your logon credentials” please click on the “ Forgot your password” link. Enter your email address and click submit. This will immediately generate an email which contains a link to reset your password. Click the link and enter a new password, and login using your new password. 6) If you urgently need to place an order, you can still shop on our old website. Click here to use our previous site.